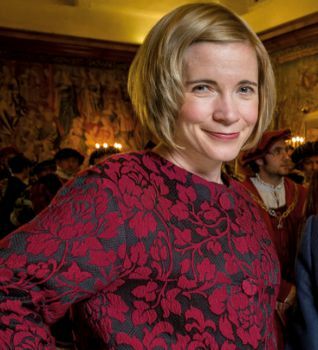 Leading TV historian Dr Lucy Worsley has been made an honorary doctor of letters by the University of Sussex this afternoon – the first of a clutch of leaders in their field to be awarded honorary degrees. The presenter and author already has a PhD from Sussex for her 2001 thesis on seventeenth century aristocrat William Cavendish and his patronage of architecture, which was later turned into her book Cavalier: A Tale of Chivalry, Passion and Great Houses. Since then, she has gone on to present documentaries including Elegance and Decadence: The Age of Regency (2011), Harlots, Housewives and Heroines: A 17th Century History for Girls (2012), and Dancing Cheek to Cheek: An Intimate History of Dance (2014). She is currently Joint Chief Curator at Historic Royal Palaces, a role she has held since 2003, looking after the Tower of London, Hampton Court Palace, Kensington Palace State Apartments, the Banqueting House in Whitehall and Kew Palace in Kew Gardens. Also receiving honorary degrees are science presenter Alice Roberts and journalists Simon Jenkins and Jon Snow. The graduation ceremonies kicked off at 2.30pm this afternoon at Brighton Dome, the first of nine ceromonies this week in which more than 3,000 students are being conferred with degrees and diplomas by the Chancellor, Sanjeev Bhaskar. Among them will be 1,200 who are the first to benefit from Sussex’s First Generation Scholar Scheme, which provides wide-ranging support before, during and after university for those students with little or no family experience of university life. The Vice-Chancellor, Professor Michael Farthing, said: “We are extremely proud of all our students, from all corners of the globe and from all walks of life, who are graduating this year. This year’s graduands come from more than 150 different countries, including Canada, Greece, Nigeria, Malaysia and Brazil. Their ages range from 19 to 65 years old. Joining Sussex students this year are 159 medics graduating from Brighton and Sussex Medical School (BSMS). Jon Snow, anchor of ‘Channel Four News’, who will become an Honorary Doctor of Letters (Friday morning ceremony).